Recently conducted research has shown that teen alcoholism is most likely in upper-class families. The study cites many possible reasons why teenagers from higher income families are more likely to drink compared with teenagers from lower income families. The research was conducted by the Health and Social Care Information Centre, a UK based organization. The organization studied approximately 120,000 teenagers and published their findings. The study suggests that 70 percent of 15-year-olds with wealthy backgrounds had tried alcohol, compared to their less wealthy counterparts, where only 50 percent had consumed alcohol before. Teenagers from upper-class families are twice as likely to drink more regularly. The most affluent group of underage drinking teens was twice as likely to regularly consume alcohol and most had drunk a full alcoholic beverage before. The study also concluded that these teens were most likely to continue regular drinking throughout their life. Racial and religious backgrounds also seem to influence teen alcoholism. The Health and Social Care Information Centre states, that 70 percent of Caucasian teenagers had drunk alcohol compared to a quarter of African American and minority teens. Data compiled by the National Institute on Alcohol Abuse and Alcoholism (NIH), depicts that over 30 percent of white males and over 23 percent of white females are daily heavy drinkers. This is compared to 25 percent of African American men and 19 percent of African American women who are heavy daily drinkers. This is a startling statistic, which can most likely be correlated to teenage alcoholism. Although the drinking age has been established as 21 in the United States for over two decades, many American parents have adopted the “European” parenting model, which allows children to drink before the national minimum. The European model promotes parents permitting children to drink at home. This concept was developed in an effort for teenagers to learn about alcohol and its effects on themselves in a safe environment however, those practicing this methodology have been experiencing some adverse results. Although many parents may view allowing their children and their friends to drink within the confines of their home as a safe and alternative method to discover the effects of alcohol, researchers and doctors throughout the country believe this isn’t the most effective teaching method. One of the most important ways to educate the youth is to lead by example. This is a concept that may seem so simple, yet is not implemented enough. Promote an environment where children feel comfortable asking whatever questions they may have about drinking. To put the theory to practice firstly, parents can drink responsibly. Guardians should be open and willing to have honest conversations with their teenagers about drugs and alcohol. 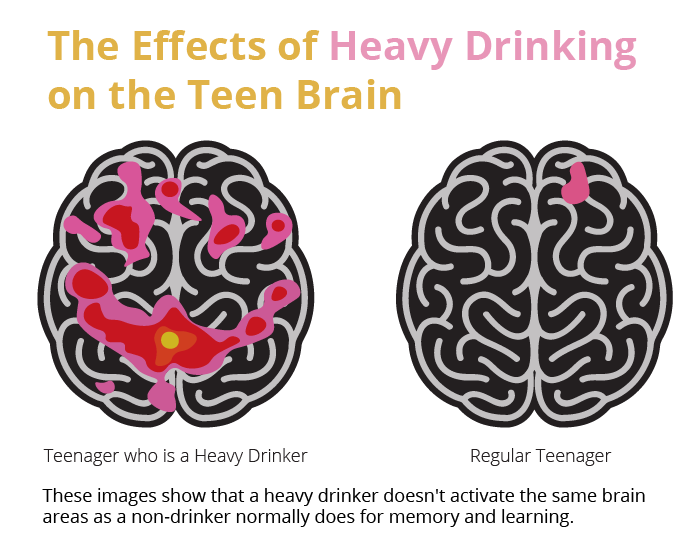 Many teens may be misguided and believe alcohol must be safe since it is legal at age 21. This is not the case. Promote an environment where children feel comfortable asking whatever questions they may have about drinking. Don’t openly leave alcohol out or liquor cabinets open. It is important to not have permissive attitudes toward underage drinking. If underage drinking is shown during a movie or television show, be sure to talk to you children about its negative effects. Talk to your teenager about peer pressure and not succumbing to it. Research suggests that most children try alcohol for the first time at age 13. Not only are they trying alcohol at this age, but youth are also participating in heavy drinking. Heavy drinking is considered as five or more drinks on five or more occasions in the past month. The Brain: Alcohol interferes with the brain’s communication pathways disrupting mood, communication and motor skills. The Heart: Cardiomyopathy, arrhythmias, stroke and high blood pressure all common symptoms in alcoholics. The Liver: Steatosis, hepatitis, fibrosis and cirrhosis are just some diseases correlated to alcohol abuse. The liver is one of the most affected organs in the body by alcohol. The Pancreas: Pancreatitis occurs when the organ produces toxic substances. This causes inflammation and swelling of the pancreas, which results with the disease preventing proper digestion. Intestines: Alcohol causes irritation in the intestinal lining. Chronic drinking can cause ulcers and inflammation. Lungs: Alcohol can cause alcoholic lung disease and increases the perecentage of an individual contracting pneumonia or developing lung cancer. Additionally, those who drink are more prone to developing mouth, esophagus, breast, liver and throat cancer. Over time or in a mere instant, there are many short-term and long-term side effects that can alter a person’s life, whether it be getting into a fatal car accident, having a heart attack or systematically abusing your liver. Underage drinking and teen alcoholism are detrimental to youth and can be a gateway substance, leading to further abuse of other drugs. If you or a loved one are struggling with alcoholism, Seaside Palm Beach can help. For over 20 years, Seaside Palm Beach’s holistic approach to addiction care has boasted industry high success rates. With evidence-based, proven treatments our patients learn how to defeat their disease and achieve sobriety. Seaside Palm Beach is an all-inclusive, premier addiction facility. Thousands of patients have already experienced success with the programs provided here. Seaside offers onsite medical detox, innovative and specialized therapies and has earned the gold seal of approval from the Joint Commission on Accreditation of Health Care Organizations. To begin your path to sobriety and for more information please call, (888) 997-3274.